High on the list is the celebrated Detective Superintendent Evert Bäckström, in charge of the investigation. Unfortunately for him a high profile case really gets in the way of his routine, namely avoiding the office, keeping work to a minimum and steering well clear of his inept colleagues – aside from the attractive ones, of course. Luckily, by virtue of his questionable contacts, Bäckström has an unequalled skill for having the guilty handed to him on a plate. All he has to do is break every rule in the book – and receive a healthy wad of cash for his trouble. But this time he’s in for a surprise because even Bäckström couldn’t have predicted where this trail would lead, or how far from comfortable he might be at its end. Bäckström is an interesting character, he’s sexist, egotistical and he’s also a police officer, a corrupt one at that. Like most “bad boys” women want him, he’s the proverbial light that draws the moths and in an ironic sense he takes the form of an antihero. Bäckström exploits his connections to the rich and powerful as regularly possible to his gain and relies on his cash being laundered through betting shops. Leading an investigation into the murder of lawyer Thomas Eriksson allows Bäckström access to a very valuable music box, one with connections to the Swedish and Russian royal families. It just so happens to make it’s way into Bäckström’s possession and he plans to use it to fund his lavish lifestyle. As the investigation into Eriksson’s murder unfolds, links to the Mafia, motorcycle gangs etc are discovered, was it coincidence that he was famous for defending gangsters and crooks? When an art specialist reveals that Eriksson had extremely valuable Russian artworks in his collection as well as the music box which are now all missing things really begin to get interesting. With twists and turns aplenty, this is a brilliant example of Scandinavian crime fiction. It cries out to be made into a film, a character such as Bäckström is so loathsome and horrendous, that I would love to see it played out on screen. Persson has created something so intriguing, interesting and utterly brilliant, the characters are well formed and fleshed out, the team that Bäckström works with are a spectrum of weird but interesting people and the plot is something short of genius! Despite this being the third book in the Bäckström series, I felt that this read well as a standalone and will definitely be looking out for the other two books. This is an author I will absolutely be adding to my “must read” list for the future and would recommend that you do too! 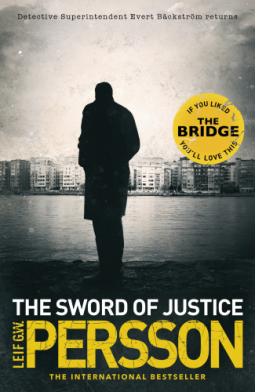 You can buy a copy of The Sword of Justice here.